This was the number one "digged" item on Digg.com for today. Coincidentally, Phuket, Thailand is the number one place we've been dying to go to since we moved here. Apparently it's a really awesome beach and a cheap trip. I know, right? It looks amazing. For those of you that have been, I welcome tips/info/things-to-know-before-ya-go. We went to Phuket for years at Xmas time. Amazing trips! Never been there but it looks like paradise. Definetly stay away from the elephant rides! Serious torture and animal cruelty! Don't support them! FYI...I LOVE monkeys too! Keep posting photos and videos of them--I'll never complain! (My husband doesn't really like them). My husband and I love your blog! Keep it up! OK that got a genuine LOL from me. Grat picture of the boats! My wife and I just got back from a trip to Phuket. 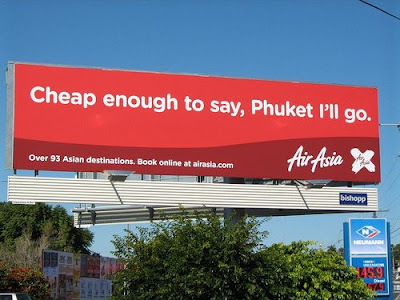 We'd been planning on getting to Phuket for quite a while, but just never did it. Unfortunately it rained most of the time, so our activities were restricted. The beach water wasn't very clear either, due to churned up silt. Is the photo in this picture supposed to be Phi Phi Island? Where the movie The Beach was filmed? That's what it looks like to me! Anyhow, we're definitely going to have to make a second trip up there in a few months when the weather is better. Brad, I think it is. We just saw a friend's pictures last weekend of Phi Phi Island and it looked almost exactly like this. That's a bummer about the rain! I hope you guys had a good time anyway though. At least it's a rather inexpensive trip, so a "re-do" won't kill your bank account too bad. Very true! That's one thing that's good about Asia. Traveling is cheap. Dunkin Donuts, where's my glazed?! Pizza as a Cone. Is this really a good idea? I'm confused. This is a coffee shop, right?